Click to download and print the invitation. Invitations for a special beach wedding are the first introduction your invited guests have to your wedding. An invitation coastal design will alert your guests to come dressed for a sandy and ocean breeze venue, instantly conveying the tone of your nuptials. Download free invites using Adobe online. Fill in the details of the who, what, when, where and why for your wedding. 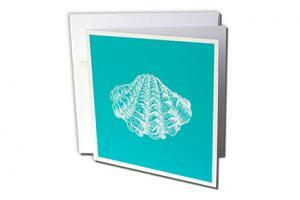 Print the invitations onto card stock, stuff them in envelopes, and mail them out to your wedding guests. There are hundreds of designs for beach themed invitations, just as there are many variations for traditional wedding invitations. The invitations can be single panels or folded, can include a vellum overlay or accents, and can be nearly any size or shape including edges scalloped like waves. Colors range from simple, formal monochromes to delicate pastels to vibrant rainbows. Invitations for an informal affair can have a bright and bold color palette, which is not as appropriate for a formal evening affair. For a formal wedding, opt for softer shades or a monochrome look. There are many invitation colors available to match your wedding colors, but take care not to overdo your use of color. If a couple can't find the right beach invitations for their event, another option is to create photo invitations with pictures of the beach where they will wed. Basic beach images, such as hearts or the wedding date drawn in the surf, are popular images to use. Starfish: Buy starfish at a local beach store or online. Print the invitation details on cardstock. Attach the invitation to the starfish with ribbon or place the card stock in a box with the starfish on top of it. Mail or hand-deliver the boxed invitations. As an alternative, you can use a sand dollar or a shell in place of the starfish. Sand in a bottle: You can purchase bottles with cork stoppers from online wedding favor stores or local party stores. Fill the bottle of the bottle with some sand and small shells. Print out your wedding invitation details on a piece of vellum and roll it up like a scroll. Tie the scroll with a raffia ribbon or a color ribbon that matches your wedding. Pop the scroll into the bottle and ship the bottles in a box or hand deliver to each invited guest. Pop-up invites: Use your favorite beach symbol as the base for your wedding invitation. Work with an invitation designer to create a three-dimensional invitation using your symbol. For example, create an invitation on a beach chair that lays flat inside of the envelope but transforms into a three-dimensional chair when assembled outside of the envelope. You can also make the pop-up invitation yourself, but it will take some time to assemble if your invitation list is long. When adding these accents, however, couples should be aware that they can drastically increase the price of the invitation and the postage necessary to deliver it. While the basic wedding invitation wording is the same for a beach wedding as for any other wedding, invitations to this type of destination wedding do require some special considerations. If many guests need to travel to the event, the invitations should be mailed earlier than the standard six to eight weeks prior to the wedding to allow them to find the best travel deals and arrange for any other travel plans. Note if the ceremony is taking place on the sand so guests can dress appropriately, especially for footwear. Many beaches have limited parking available, so along with a map of the area, include information on parking garages, lots or street parking that is close to the wedding location. 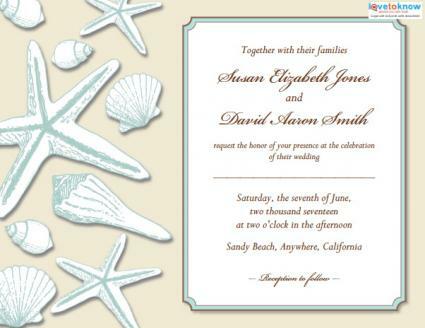 Beach Wedlock Invitations: Find hundreds of different beach invitations from which to choose, including those shaped like umbrellas and boarding passes or with seashell charms included. Beach Wedlock Invitations offers one of the largest selections of beach wedding invitations, many of which come with matching stationary and other accessories. Passion Paper: Choose Passion Paper for one-of-a-kind invites that stand out from the rest. Offers bottled invitation options, three-dimensional embellishments, box invitation sets, and more. The Printable Wedding: The Printable Wedding offers a number of beach themed invitation designs geared to the DIY bride and groom. 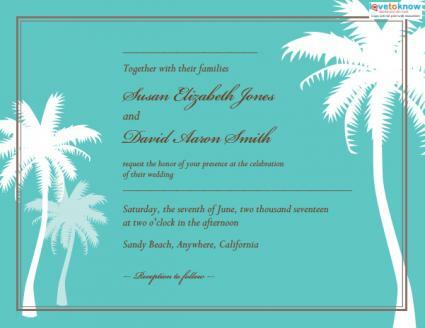 Choose a seashell, palm tree, wave or other beach themed design from their selection, customize it online and print it yourself at home for a fraction of the cost of some invitation providers. Designs by Lenila: At Designs by Lenila, you'll get true handmade and custom invitation designs. You can choose from designs she offers on her site, alter designs to fit your needs, or work with her to customer design invitations from scratch. The right beach wedding invitation can help your celebration set sail with elegance and distinction. With dozens of designs to choose from and many retailers offering these themed invitations, every couple is sure to find the perfect beach note for their happily ever after.